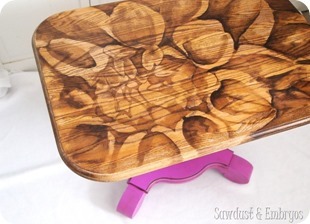 Shading with Wood Stain is SUCH a fun and unique way to create beautiful art on furniture… or anything that’s wood! (click here to see how I came up with this technique, and the variety of different pieces I’ve done!) In this post I’m going to share a simple tutorial for the beginner. Let’s get started! 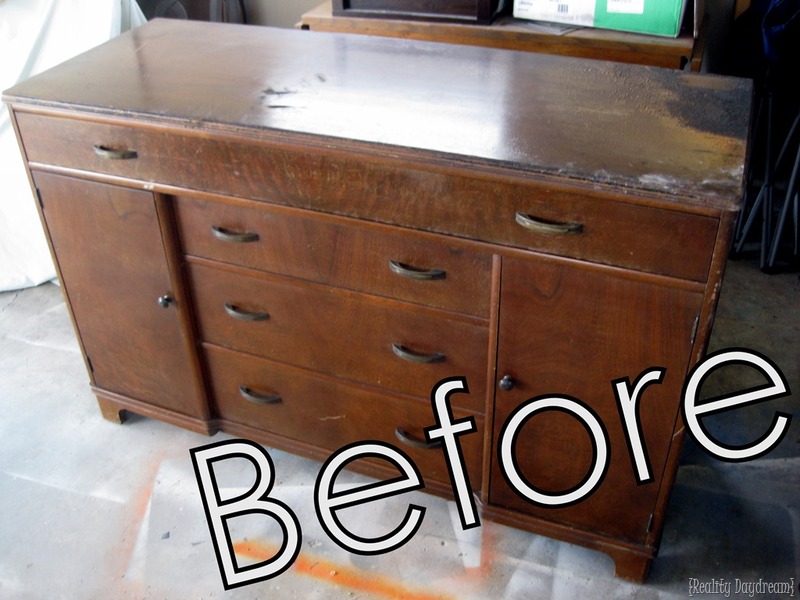 If you missed Part 1 of our Buffet Transformation, click here to read about how we rescued this buffet from a burn pile… stripped, sanded, repaired, primed, and painted! Next is the fun part. You may not know this about me, but I love to draw with charcoal. I love the shading, and the instant gratification of seeing a masterpiece unfold before your eyes. I can’t draw a person to save my life… but I can shade, yo! I get an inordinate amount of joy from coming up with new ways to make furniture (or a room) unique and beautiful. And I started thinking about how, in theory, you should be able to get the same charcoal shading effect using STAIN on wood. I was realllllllly excited to give this a try! Using this as inspiration for a flower design, I drew out some flower petals lightly with a pencil on the top surface of the buffet. Can you see it? If you’ve ever stained something before, you know that the longer you leave stain on the wood, the darker the finish will be when you wipe it off. We used the darkest POSSIBLE stain we could find so we would have the most contrast. With that in mind, I started with the center petals and stained each petal, starting at the center and working my way out toward the tip of the petal using this stain (my fave for this technique!). UPDATE! Since doing this first piece of furniture, I’ve found that applying the stain with a cloth over your finger gives a much cleaner line than the paint brush. Check out my video tutorial for even more details! As you can see I didn’t stain all the way out to the edge of the petals, because I wanted that to be the lightest portion of my ‘shading’. Using a dry cloth and my finger, I wiped away from the stain to allow a smooth transition from the stained portion to the outer unstained portion of my petal…. rubbing it to create that shaded look. 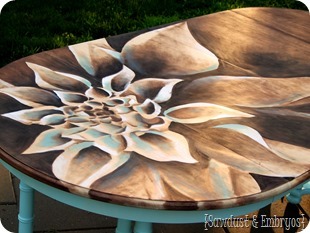 Leaving the majority of the stain on the petal to ‘soak’ for awhile, I moved on to my next petal and repeated! 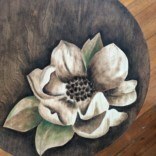 By the time I got all the way around the center petals (about 5 minutes), I figured it was time I could go back around and wipe off a little more stain on each petal, allowing the stain to gradually get darker toward the center. 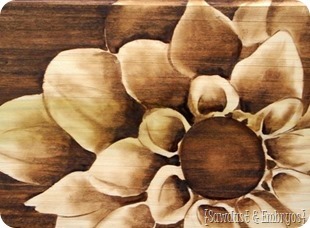 I continued to repeat this process on each petal as I worked my way away from the center of the flower. Every 5 minutes or so, I would go back to wipe off a little more from the previous petals. Once I had worked my way all the way out to the edges, staining every petal using my graduated tinting technique, I finally wiped off the remaining darkest stain on the inner part of each petal. Then, the whole piece got a thick glossy coat of poly (I use this poly). I wish I had taken ‘after pictures’ before I polyed, because the glare from that glossy finish makes the design not appear to POP as much in pictures. It’s like a legit piece of artwork. I’m in total shock that this technique has never been done before… because it’s SO easy, and has such a dramatically beautiful effect. I’m pretty stinkin’ proud of myself for coming up with this one! And I love the creamy green color of the body too! And the way the stained flower petals wrap around the edges of the top surface. I’d say this is a pretty epic story of ‘Rags to Riches’, when it comes to this buffet that was tossed into a burn pile. I’m so glad we rescued it and gave it new life! You can just barely tell where the burning had taken place on that corner. But you wouldn’t notice it unless we pointed it out! We hope you’ll have the confidence to give this a try yourself! The following is a video tutorial with even more step-by-step instruction! For simple instructions on stripping a surface down to the raw wood (in preparation for this staining technique! )… click here! UPDATE! Since writing this post, we’ve done this technique many more times and have some beautiful artwork to show for it (click here)! It truly is easier than it looks! Click each pic below to be directed to that post. We also have a video tutorial coming soon, so be sure to subscribe to our blog so you get updates each time I publish a new post! And feel free to ask questions in the comment section. I’m usually pretty good at responding quickly! BE INSPIRED! Really beautiful work! Thanks for sharing! I’m really looking forward to trying this! What kind of cloth did you use? I know different types of cloth can absorb liquids differently. Do you find that one type works better than another? Thanks! Hey Fran! I use cut up cotton T-shirts! Awesome, that’s what I was thinking too. Thanks! Hi there… sorry if this has been asked and answered already. ..but how did you paint the green part and with what type of paint? Looks really nice. Almost like enamel finish with no paint strokes. We primed with Kilz oil-based spray primer, and painted Sherwin Williams ‘Grandview’ using a paint sprayer. It turned out so smooth and glossy! I haven’t read through all the comments so not sure if this has been answered or not but….. I just tried this for the first time on a wine box that I made out of plywood. The stain just ran through the grain and didn’t achieve the look at all. I am guessing with the plywood being so porous, that was bound to happen. Do you have a suggestion on what type of wood to use for this or maybe is there a pre stain treatment that you use that I managed to miss in the prep of the plywood? The type of wood does matter SOME (for example, Poplar and Pine work best for me), but the thing that matters MOST is that you have a TINY amount of stain on your cloth. If your cloth is even kind of saturated in one spot, that will soak into the grain really fast. Does that make sense? Other than sanding with 220 grit before staining, there should be no other prep work. I hope this helps! Hello! Is there a product that you would recommend putting on before you stain to avoid it bleeding? I read your advice that less stain will do better so that’s good advice and I will use it but I would like to know if there is some sort of clear primer that would help with this as well? Thank you! Hey Anna, I’ve done some testing with this, but I’ve found the best way for having minimal bleeding is to use VERY little stain on the cloth on your finger, and use the edge of your fingernail to get a crisp/straight line. Loved all the pieces i see. Reminds me of woodburning. I’ve done my stain painting more like i paint watercolors but with oil based stains. I use an art brush to do mostly moth orchids then a but larger brush and cheese cloth to fill in the dark background. Similar yet different. My daughter calls them elegant. I believe that could be applied to your work. Beautiful and elegant. Hi Bethany! I was finally brave enough to try this. I loved howorking it turned but, but you see the pencil lines. Any suggestions on how to get rid them before I seal it? Thanks! You should be able to just erase them right through the stain! As long as you haven’t sealed it yet. 🙂 I’d love to see pictures! 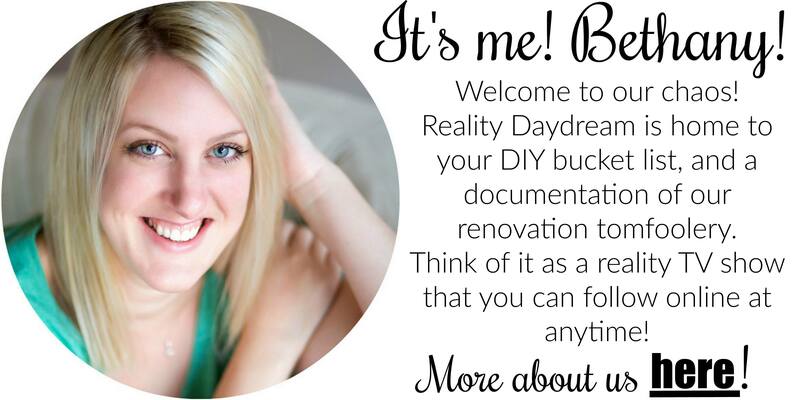 Send them to my email beth@realitydaydream.com! 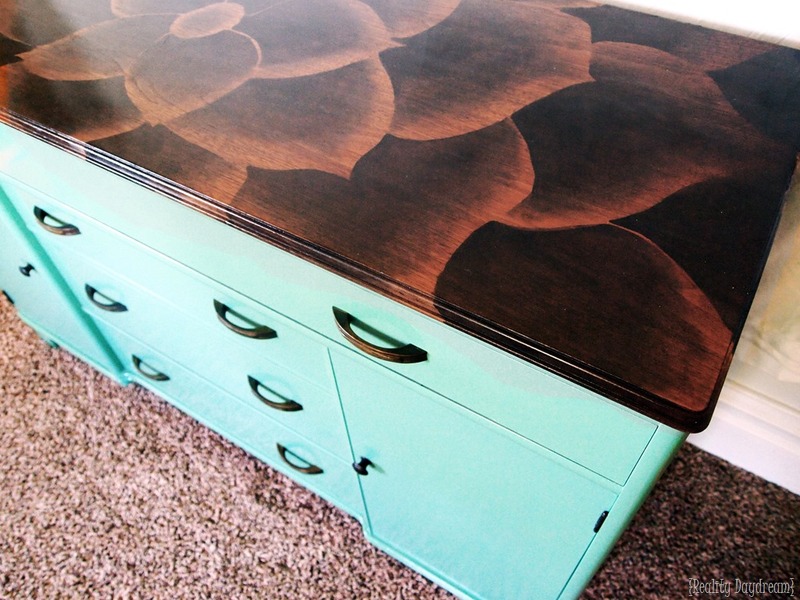 What shade of stain did you use for this project in order to achieve this look? I think a hummingbird would be so fun! And pretty! Be sure to send me pictures! Just tried this on a VERY old iak dresser I picked up at a yard sale last weekend ($15!) and it is now my new favorite addiction!!!! Thank you for sharing your amazing idea with the world! My internet is very slow at the moment so I will keep this short…wow! Wow, wow, wow! I am amazed, pure and simply, amazed by your technique. The applications are endless. But like so many things, I know this is much easier watched than done; you obviously have incredible artistic talent. Thank you for sharing! Thank you Beth for the inspiration. I too have worked with charcoal because I like the way it shades. Never thought to try it with stain. I have a small cabinet sitting in my work shop because I had no idea what I wanted to do with it, now I know. Thanks again for the video. Do you do images other than flowers? I am interested in doing a different image but I am nervous to try because I’m not good at knowing where to shade at…also, when doing the edges, before you begin rubbing it, would a pain brush work for that? Hey Amanda! I’ve done a few stained pieces that aren’t flowers (a horse and a mountain scene) but I find that flowers are the easiest because it’s a repetitive pattern, and it’s easy to see where the ‘shadows’ are on each petal… therefore showing me which parts need to be dark and which parts need to be light. Play around with some scrap wood to get the feel for it! You can absolutely use a paint brush to apply the stain before rubbing it, I just personally prefer to use my finger with a cloth because I find it easier to control how much stain I’m applying. Good luck! Keep me updated! A great way to determine where shading goes is using a simple photo editing program with an image. First turn the image to a black and white image, then adjust the contrast on the black and white image to see where the darker shading exists. Amazing, you are an artist and should be selling each item as a work of art.You should be very proud of yourself. This is innovative and fabulous. Oh my sweet Crafting Goddess you are genius. I’ve seen this technique and I’m not positive if it was your work or someone who copied this technique. Either way I can now give you the proper kudos for being the mastermind behind this technique. Unfortunately, I had ONE piece to redo and it’s done-prior to finding this on the web. Oh, how I wish—-but not to be. I may just get some wood and see what I can do for a tray or? –something small in any case. Beautiful job all the way around! Just absolutely gorgeous. I would so love to be able to do this. I may try on a small piece and see how it goes. Thanks for sharing. Thank you for inspiring me! I gave it a try after watching you video and I’m hooked! Already planning my next piece! Wow, Beth, your site is so fun!! I’m finding all kinds of great ideas from you!! I just picked up a bakers rack from goodwill, and I’ve painted the frame and sanded the shelves, and this will look epic done to it!! I had planned on painting some kind of quote on it, but this will be a much better effect, I’ll drop you a pix when I finish it….keep on creating, you’re amazing!! Beth I love your work! I would like to try something using colored stain. Have you found a brand that you like? Beth,do you have any vidios or kits with a the different flowers? I would be interested in buying. I’m not a very good artist myself.I have a the table,now I just need the know how. Hi Jane! I’ve shared all my secrets in the step-by-step video included in this blog post. Nothing to sell! I done shading and it looks great but….with the pencil marks go away when I poly? No definitely erase them before polying! I’d love to give this a try but I can’t draw a stick man much less a flower. Can you do a tutorial on pattern techniques? I sooooo want to do this. Your work is stunning! I just LOVE your work! It is beautiful. I’ve recently gotten into projects with wood and love the effects of staining and using my wood burner! I’m pregnant at the moment so I’m hesitant to try a large piece and be around the fumes too long but may attempt a smaller project with shading 🙂 my question is..have you done any shading with the gel stains? I’ve heard they are better to use on woods such as pine and poplar..but not sure how well they would move though due to the consistency… I will be subscribing to your blog so I don’t miss out on anything. Again..beautiful work! Elisa, congrats on being pregnant! Just wear a respirator and you’re golden! As for gel stains, I’ve found that they’re a little harder to ‘shade’ with and manipulate for obvious reasons. They still work, but the result isn’t as smooth and flawless. It’s got a more blotchy ‘ abstract art’ look when you’re done. But I kinda like that look sometimes too, so it’s really up to you! Would LOVE to see your work when you’re done! I lose detail and some of the contrast in the really dark areas when I poly. I’m using a high gloss polyurethane. 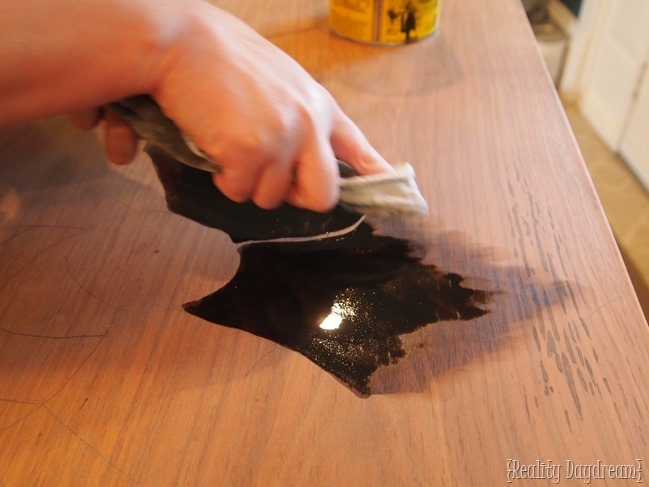 Have you tried using a wax to seal after staining? Any tips on preserving the detail and contrast? 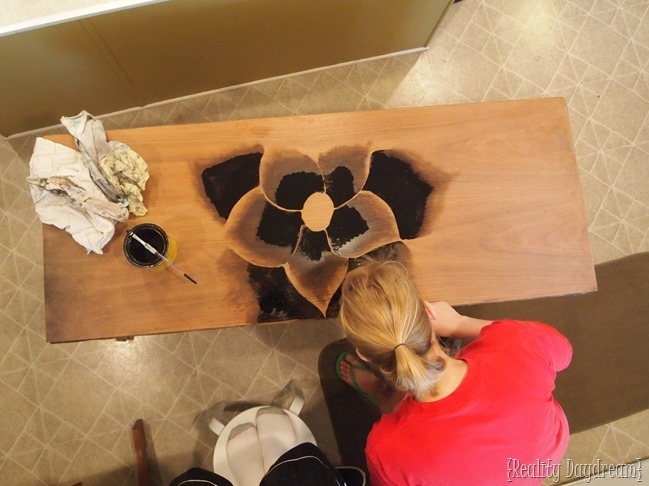 Use a lighter color of wood. In order to tell how dark the unstained wood will turn out after poly, wipe some mineral spirits on your substrate. While its wet, you get a chance to see how just dark the the wood will be after finishing. Let the spirits dry before staining. There are stains that will help you control color better. 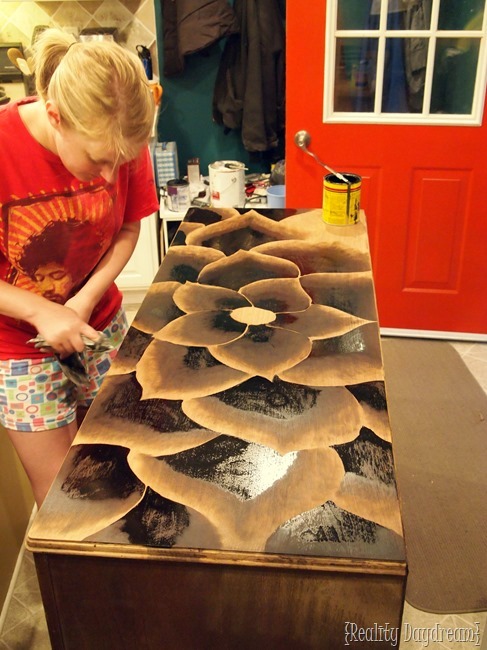 On dark wood I would use a gel stain or a wiping stain as opposed to a penetrating stain. The higher solids content and greater viscosity give much improved control of the color and will allow you to achieve darker shades. I’ve been a wood finisher professionally for 13 years and there’s always more exciting things to learn! Excellent tips! Thanks for sharing this Jeannine!! I am uber loving this technique! You are so talented. Do you know where I can order the rust oleum stain and the coloured stains? Can’t seem to find them here in Alberta, Canada. Did you stain the entire top before you started the petals? No I do the petals first, and the background last. Can’t wait to see it! Email me pics! Lisa, make sure that your wood is sanded sooooo smooth (finishing up with 220 grit) and apply the stain with a cloth over your finger. Be sure to just get a teeny amount of stain on your fingertip, and you might even want to wipe some excess off on the edge of the can. This should give you a nice clean line without any bleeding! Thank u!! This has to be the most emotional piece. No waaaaay! That turned out awesome! I love that you tackled staining an animal. 🙂 Great job! Thanks Beth! Browsing your website I have pinned TONS of stuff from here! So I just subscribed so that I don’t miss out on any new ventures!! I love DIY! I did a table top for an upcoming show; I love how it turned out. Thank you so much for showing us this technique. Yay Robin! I’m glad it turned out! Pleeeeease send me a pic at sawdustandembryos@gmail.com… I just HAVE to see!! Hello! I love the look of this and I was thinking I’d love to apply it to a more geometric design. Have you experimented with using tape etc. for clean edges? Love this look! I am needing to cover an ugly laminate counter top. I know nothing about paint or stain. Could this be done with some type of modifications? What awesomely, beautiful art!!!! I know you said it’s easier than it looks but if I could only pull that off, whew!! This is definitely inspiring and I hope to try someday… Maybe this summer! Thanks for sharing!! You’re super sweet! And you definitely SHOULD give it a try!! I am now so embarrassed. I now know you have a video and are promoting the Rustoleum stains, etc. I just got carried away with joy over finding you! Anyway, my intentions for suggesting were pure! Hehe that’s OK Linda! We’re actually not sponsored by RustOleum, they just send us free product… which is nice. But it would be awesome if we were getting paid. Haha! I suggest we tag this miracle procedure “Shades of Bethany”. Next I would suggest you write a tutorial on this for YouTube. Next, get these stain makers to sponsor you. MAKE SOME MONEY WITH THIS GENIOUS!!!! Love this!!!! I decided to try this out myself with a scrap piece of wood I had laying around, but I ran into a little issue. When I applied the stain it started to bleed down the grain of there wood!!! I was wondering if maybe it’s because of the peice of wood I was using? Or maybe I did it wrong, either was any advice you have would be helpful. I have a dresser that is in need of a new finish and wanted to give it a try! have you tried sanding the piece of wood first? take away any natural grooves the surface of the wood might have to give the stain a path to follow. Oh yes we sand these pieces verrrry well before staining. Some wood types make the stain run more than others. Super helpful! I’ve never seen this done before, so I loved your video! Made me decide to take the plunge and try it this weekend! Thanks for the help! I have never felt compelled to comment on a blog before, but I love your raw approach! Very inspiring! Thank you for putting this out there Beth. Amazing idea. While I also employed old shirts I also used Q-tips and a small detail brush where needed. Now I’ve got an amazing table for my family. I wish I could post a picture here for all to see. Again. THANK YOU! they will custom tint stain to any color you wish. OMW! (Oh my word) this is absolutely the most beautiful thing I have seen! I am staining my first piece of furniture and was looking for how to’s and ideas. This is very much out of my comfort zone but I just might try a little something on the corner. Too cool! Thank you for sharing your talent, and making me feel inspired to try something new! You should you SHOULD! It really is much easier than it looks. Although best to practice on a scrap piece of wood first. Be sure to send us pics when you’re done! So I found this post the other day while trying to figure out what to do with a dining room table I bought in a yard sale. Your work is gorgeous! After prepping the table top I decided to give this technique a go. It was super easy and I’ll definitely do it again I ended up with a beautiful table top !! 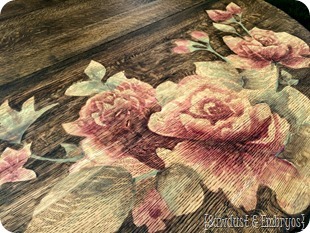 Beth, just discovered your blog and I love this staining technique on furniture to truly make it a unique piece. Have you done this with color tinted stains? I’m thinking of doing a dresser piece with a peacock motif on the top. My concern is bleeding. What are your thoughts? Thanks for your response. If you give it a go, please send me pictures! I’d lvoe to see what you come up with! Polyvine company from the UK has wonderful products-I use them a lot! You can buy them from a US-based company through Etsy, Ebay, etc. 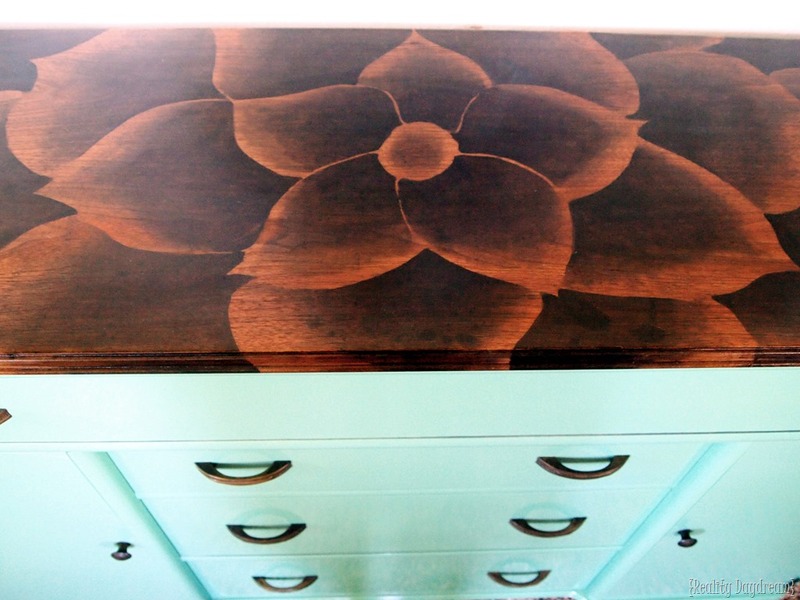 Hi Beth, how long did it take you to do the lotus flower chest of drawers? I’ve started shading a piece of wood (much smaller) for practise and was doing it for about 2 hours but got so tired then I decided to carry on next morning. Do you think it’s okay if I don’t do it all in one go? What yo you mean by ‘poly’ (I’m writing from the UK :-)) Is that varnish? Thanks in advance for your answer! Hi Patti! This first piece I did of the lotus probably took me 4-5 hours. Since then I’ve gotten faster, but it’s something you get into the groove of and feel more comfortable with the more you do. It’s totally fine to take breaks and do it in sections! As for poly, it’s basically varnish (polyurethane). You can get it in different sheens, depending on the look you’re going for. I would love to see pics when you’re done! Good luck! Can you put on clear wax instead of poly? In theory, YES! We haven’t tried it though. I just came across this photo on Pinterest. Wow!!! This is gorgeous!!! You are incredibly talented. Thanks for sharing! Oh man! That is the most beautiful thing I have ever seen someone do to a piece of furniture. Just. Wow. I am in the process of redoing dressers and desks, I wish I had a flat topped piece to work with! Hi Alexis! I’m excited that you’re going to give this technique a try!! It’s super fun! The thing about wood putty is that SOME brands ‘claim’ that it’s stain-able, but in my opinion it never quite matches and always looks funky… unless it’s in an inconspicuous place. It’s totally up to you though! Please send pics when you’re done!! That is unbelievable! I can’t wait to try it. Thanks for sharing! Hey! We did this and did the whole picture but the poly wiped it all away. Is there a certain poly we should use? A spray? Or is painted on poly okay? And is there a certain amount of time we should wait? Hi Peyton! i’m soooo sorry that this happened to you. The only explanation is that the surface you were staining on wasn’t fully sanded/stripped down to the wood. Therefore the stain wasn’t soaking into wood grain, it was just sitting on top of a layer of varnish or sealer, and could easily be wiped away since it didn’t have anything to soak into. If you try again, I would use a finish stripper and make sure you’re down to the raw/unfinished wood before you start again. Good luck! Send pics when you’re done! 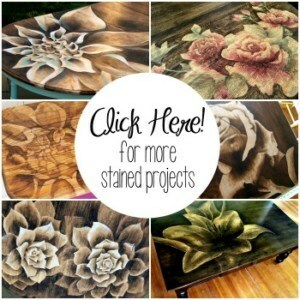 Ok so I really love all of your awesome stained pieces, and have followed your blog for about a year. I was so excited to get featured with you over at Better After. So super cool. I don’t know how you find the time with twins. WOW!!!!! DID I SAY WOW!!!!! HOW COOL !!! I CAN’t THINK OF ENOUGH POWERFUL WORDS TO SAY ABOUT THIS AMAZING SITE I JUST STUMBLED ACROSS!! (SO GLAD I DID) NOT ALOT OF SITES MAKES ME WANT TO GATHER SUPPLIES NOW AND START A PROJECT THE VERY SAME MINUTE, I SAW THE METHOD. I NEVER POST ANYTHING I CREATE, BUT THIS MAKES ME WANT TO SHOW THE RESULTS, (even before its done) THAT I CREATED!!!! THANKS SO MUCH FOR THE GREAT IDEA, AND TUTORIAL !!!!!!!!! YOU HAVE DEFINITELY INSPIRED !!!! Thanks!! We’d love to see pics of your work!! I’ve been browsing around your blog. I love this too!! I am so about to share this post. Great work! Also, Have you ever done a poppy flower? Hi Poppy! It sounds like the poly you’re using is pretty thick. You could water it down with a bit of mineral spirits, and this would cause the brush-strokes to even out before it dries. I know how frustrating brush strokes are! There is also ‘spray poly’ that comes in an aerosol can, and comes out a very even mist. It goes on really nicely, but we’ve found that it takes a lot of coats to be as durable as a single coat of brush-on poly. Hope this helps! Send pics when you’re done! I started doing different unique things to my furniture, then to my cabinets, and now I am turning it into a business to do for others. I am going to try your technique on one of my dressers that I am upcycling to a T.V. console, do you mind once I get my website up featuring you in my blog? Thanks again for the inspiration, keep it coming!!! You should totally go for it! You’ll be amazing! And YES we’d love it if you linked to us in your post. Can’t wait to see pics of your work! start – not too large, and flat surfaces everywhere! THANK YOU! Yaaaaay! Send us pics when you’re done! OMG. Shut up! That’s amazing!!! I bet I could totally do that. HI, I love they way your home looks. Its amazing. My husband and I was just looking at this piece and Im so excited to try it. 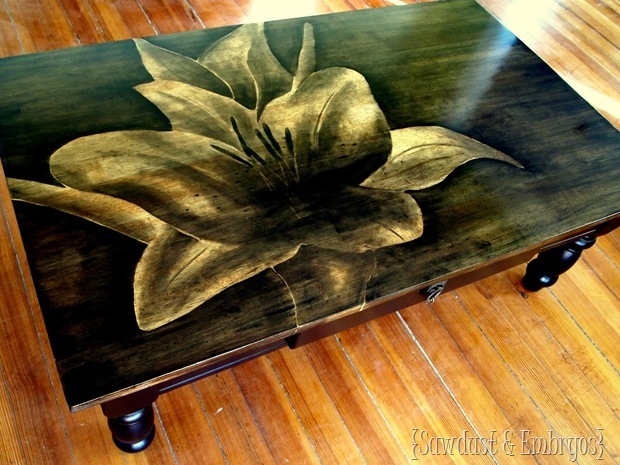 I actually have a coffee table that wanted to do something in color of a lotus but this is such a beautiful idea. Thank you so much for sharing! Just to clarify, you haven’t mentioned any priming under the artwork. Any particular reason? I absolutely cannot wait to try this and share it with you! Absolutely amazing! Yay Angela! I can’t wait to see pics! What about a video of you doing this?! I would buy a video from you. Wow! This looks amazing..Just beautiful. pinning. really!!!!!!!!really!!!!!! !too good….i will definetly try this.with what material u make stains? Appгеciate this post. Let me try it ߋut. Do not know how I miss this work last year my dearies but you hit this out of the ball park! Just imagine all of the artists that wish that they had discovered this technique. We have to name this technique after you. It will be used for years. I nominate you and suggest you get a patent name for it. You’re so sweet Karen! It’s a really fun technique! I am inspired! Well, if this wasn’t popular before it is about to become a major trend, thanks for the awesome tutorial! Beautiful! You should rescue furniture like this stain it and sell it. I think it is gorgeous!! I love this look and I’m trying create this on a dresser for our baby girl’s nursery. The only problem I’m running into is drawing a decent flower. I can paint, sew, and do anything else, but drawing is the death of me. Is there a stencil, or could you email a quick drawing and I make a stencil? Sharon, all you have to do is find a flower image you like on Google Images and print it on a transparency. Then project it onto the surface and trace with a pencil. I’ve done this many times! I so love what you have done and tried doing something similar myself. I applied the ebony wood stain and immediately wiped the outer edge off. However even leaving the stain on for those few seconds already made the wood really dark. Do you think it would help if I applied wood conditioner before staining? Some woods soak up the stain a lot faster. 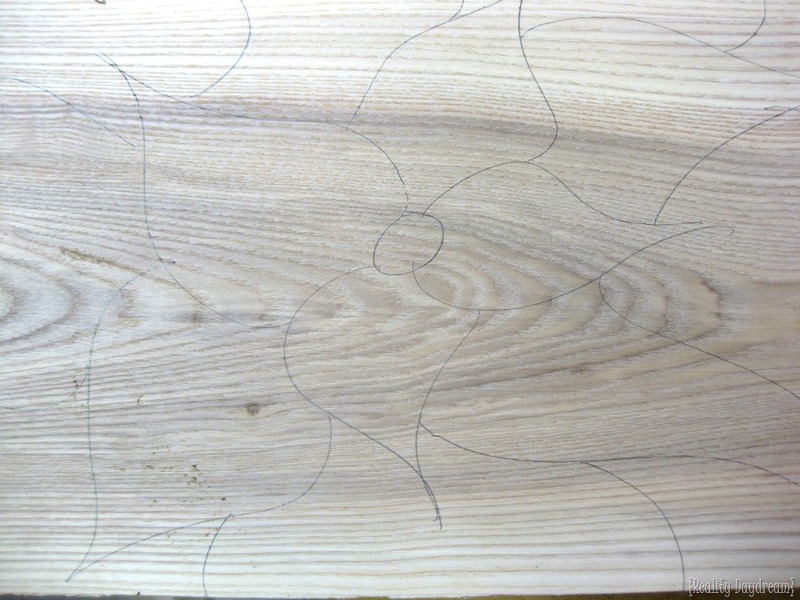 I’ve found that Pine and Poplar are the easiest to work with. 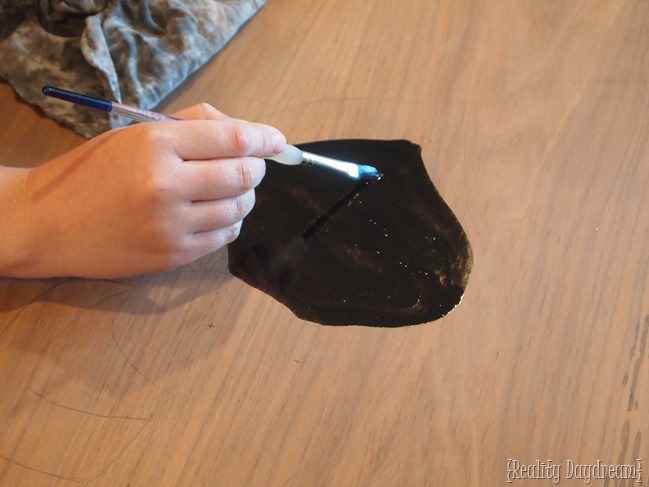 Instead of applying the stain directly on the wood, try dipping your cloth in the stain and work your way from the darkest part if the leaf to the lightest. This will give you more control. The good news is that this will take you a LOT less time because you won’t be waiting on any stain to sit. Send me pics when you’re done!! I will give it a try. I wa starting to think that I might have to try using different colored stains. Some lighter and some darker but your suggestions sounds easier. Frost if he perceives himself as a teacher, he was quoted saying: I am not a teacher, I amm an awakener. In my view this blog works precisely the same since it awakens me, and makes my mind work. I just LOVE what you did! I am working on refinishing an old sewing table right now. I am trying out your technique for the top. I hope it turns out as nice as yours did, fingers crossed! Sweeeet! Send pics when you’re done!! wow. so amazing. i have an old sewing machine cabinet that i could do this for. 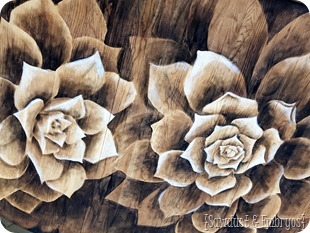 my husband is an artist, so he can draw and i will do the staining. thanx for this great idea. You should you should! And send us pics when you’re done! This is absolutely stunning! GORGEOUS! Just wanted you know that I tried this. I messed up and mine didn’t come out nearly as gorgeous as yours, but I went with it. Turns out I love it. Thank you so much for sharing this technique. You helped transform my trash to treasure desk. You did a GREAT job! Everyone that tries this has a slightly different result, and that’s the beauty of it! Thanks for sharing!! BEAUTIFUL & inspiring! Wondering how you managed to wipe off the remaining stain on the darkest part of the sections without getting any on the places you previously worked on and left lighter. I just smear away from the lighter area, and very gently because I want the dark spots to be as dark as possible. Sometimes I just blotted, and let it dry a little tacky. After you seal it and it’s all glossy, you won’t be able to tell. If you give it a try, be sure to send before and after pictures! We’d love to see what you come up with! That’s gorgeous! 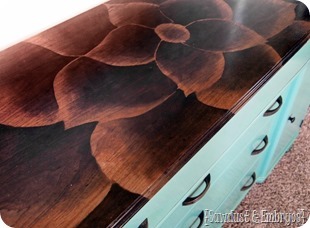 I love the contrast of the teal & the dark stain, and the flower design on the top is incredible. You are just amazing !I will try it too. Absolutely STUNNING! I saw a glimpse of this project a few days ago and have been searching for it ever since! Had no idea it was done with stain until finding you today. Definitely pinning as I want to be able to refer back to it. Beautiful work! Now I know my comment is very late but “Damn Bethany, you rocked my freakin socks off!” Like literally. I have this shopping habit thing I do every Saturday at a local thrift store. 50% off almost 90% of the store! No way in hell am I missing that sale. I’m there every Saturday. Ever since I showed him this and pulled out all the stains, rags, buffers, paints etc.. he knows I’m up to something and cringes! hahaha thanks for another new piece to keep me busy for more than 30 seconds! Damn ADHD. I have about 10 different projects that are being worked on right now. Yours is next on a $39 large buffet that someone was very neglectful with. But I’m going to love her up some an make her a home piece that EVERYONE will talk about for years to come! No worries, Girl, I’ll make sure the all know YOU did this and it’s from YOUR blog! WOW what an awesome project!! I LOVE LOVE LOVE THAT!!! I first saw you guys featured on Young House Love’s Reader Redesign and I just wanted to let you guys know that you inspired me to tackle this project on an old, worn out table that was just collecting dust at my house. Thanks to your idea it’s now being used as a pretty piece of functional artwork! You can check out my post if you want at http://www.2brokebruces.com/2013/04/flower-table.html. Love your piece(s) and thanks for the inspiration! Misty that turned out AMAZING! Thanks for sharing!! Don’t you feel so accomplished?! 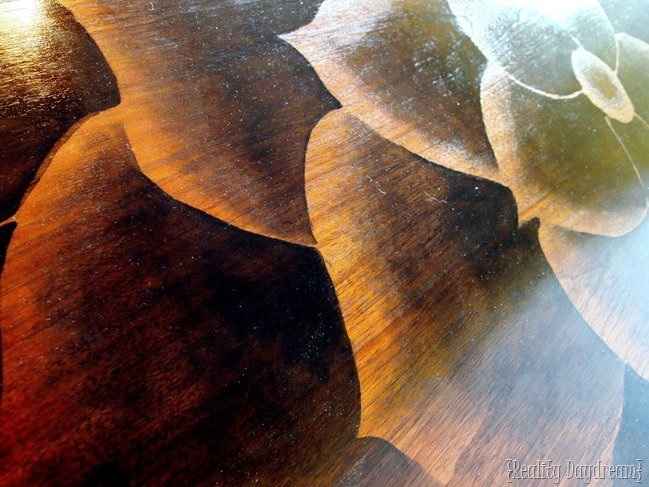 There are a number of items frequently used in wood finishing projects. This list does not include all the supplies needed, but what is most commonly used. Ooo you should you should! That sounds like a fabulous idea to use it outside! I would just make sure to seal it SEVERAL times with a good oil-based polyurethane. It should hold up in the elements… at least for a good while. As for colored stains, we haven’t used any… but I’ve seen them at hardware stores, so I know they exist! 🙂 Send us pics when you’re done!!! Hi Beth, I just stumbled across your amazing work and I have one question… do you seal all your each piece after you have blended/shaded it? You mentioned above that if you were putting it outside you would seal it with a good oil based polyurethane… do you do that with the indoor pieces as well? Thank you. You have completely inspired me 🙂 Your art is beautiful. Hi Terrie! We do seal all of our pieces, but you could probably get away with just sealing the top surface of your furniture (ie dresser top or table top) where it gets the most wear and tear. Keep in mind that, while oil-based poly is the most durable, it does leave a yellowish tint that shows up when applied on white paint. 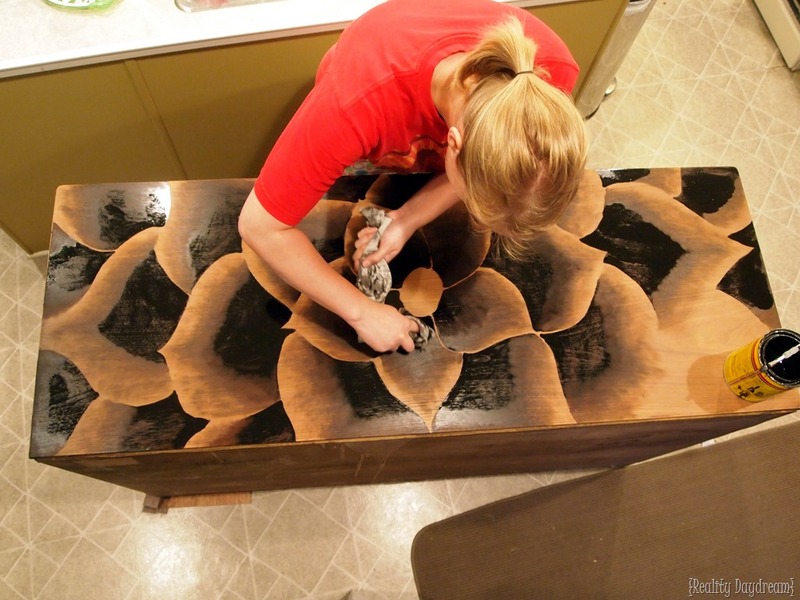 So if you’re sealing a white piece of furniture, definitely opt for water-based sealer. Good luck! Hi, this is really beautiful…great job. I love the color of the wood and the “turqouis” color, keep up the great work! Jen…. LOVE THAT! I’ve been pondering staining with a stencil, and you’ve saved me the trouble of trial and error! I’m pinning this for future projects, and I’ll be sure to link to you when I do! Take care, and stay creative. Thank you for letting me know. This is so frustrating to me and I don’t know what to do about it! Does it hurt to just mention that they were inspired by someone else? UGH! Totally Awesome. Best upcycle, DIY, revamp yet. Truly a piece of ART! Just gorgeous! I am blown away by your work, being the copy cat creative that I am, because I am not creative enough to come up with anything on my own, I decided to try this. I have a beautiful unfinished toy chest for my twins toys that I want to stain. I wanted to practice first so I am using an extra board I happen to have and practice. It’s a good thing I am because I am running into all sorts of problems. My stain keeps bleeding into the other petals. I look at yours and they are so perfectly non bleeding that I have to ask is there something I am doing wrong?? Please please help! Wonderful work! I might just try this. I’ve got a few pieces in storage, and in my garage that I could do this to. Thank you. FYI: Varathane is a varnish not a stain. Usually used as a clear coat protectant over stained furniture or floors. Some varathanes are tinted… a 2 in 1 concept, easier used on floors than furniture. I fell in love w this project. So I did one myself. The stain I used was not the best for this project. But a lil rubbing w steel wool pulled back some of the stain. Thanks for the great idea. The stain was Varathane. It’s impossible to wipe off. Lol. Wow, that’s good to know! I’ve been thinking about trying other products, so I’ll be sure to stay away from that. Was it Rustoleum? I was enthralled!! This is awesome! I have my hope chest that has traveled with me for years and is the worst for wear-I got it when I was 17yrs old-53yrs ago! I would like step by step instructions though. Anyway to get them? I’m older and don’t navigate the web as easily as others. That is so unique and lovely! I can’t draw a thing, but with your simple instructions, I have to try this! It is truly stunning! Oh my, this is stunning! I love the technique, and wonder too why it hasn’t been done before. I’ve pinned this because I have to try this! Wish me luck. I found you via Brooke’s All Things Thrifty when she featured your coffee table. I love that one too! A new follower. I’m going to do this to the top of my new desk! I have a question though and I appologize if it has already been answered…are you using gel stain?? I love this and tried it on a round table I have, it came out great. I’m going to try to sell mine and I’m wondering if you would be willing to tell me how much you sold your buffet for or how much you asked for it? How do you go about pricing your things? This is absolutely STUNNING!! Love your tutorial and pix!! So inspired to try it soon, I hope, now wheres that nearst burn pile :)!!! That is just absolutely gorgeous! It is a work of art. Love the color with the dark stain. I am pretty good with refinishing furniture and playing around with it but really struggled with this. I’m pretty frustrated actually! Lol….. you did wonderful! That looks just like a beautiful black & gray tat. You did an EXCELLENT job on that piece. OUTSTANDING!!! Just the most beautiful piece of furniture and art. Wish I had seen this before staining our home ber. I love working with charcoals too! Your piece really gets my creative juices flowing! Thank you for sharing this with the blog world. This is crazy beautiful. I have used a product one time that was clear stain that you mixed color into for the stain. I mixed many different colors of stain and painted a child’s chair with it. It is still one of my favorites because the stain just looks so much more beautiful than paint. I am going to do this technique on a table top with birds and limbs. So exciting! Thanks…my daughter found this and sent it to me. I am so glad that she did. Came over from YHL and I’m so impressed! I have pinned that fo’ shore! Amazing idea and execution! Came over from YHL and WOW! That is beautiful! I hope you didn’t have any plans to keep items on top of the buffet because it is too beautiful to cover up. GREAT job! This is gorgeous! You are really talented! I’m visiting from YHL & I’m your newest follower 🙂 Have a great weekend. Not sure I can say anything that hasn’t been said already, but I got here from YHL and that IS so inspiring! I pinned it. It will probably be another thing I pin and don’t do, but this is really lovely, you *should* be very proud of how it turned out. 🙂 Thanks for the inspiration! Popping over from YHL – this is amazing, such a great idea and you pulled it off wonderfully! SO jealous I didn’t think of this first. I don’t have patience for anything except my weird builds/crafts so I can imagine how long this must have taken! I like that it is so reminescent of this rug from Pier 1 though- would be an interesting piece to add in your home as omage to your new amazing piece! Wow, just wow….I love people that think outside of the box. I found your blog today after visiting YHL and I can’t tell you how excited I am to find a new blog to read that I can TOTALLY relate to. 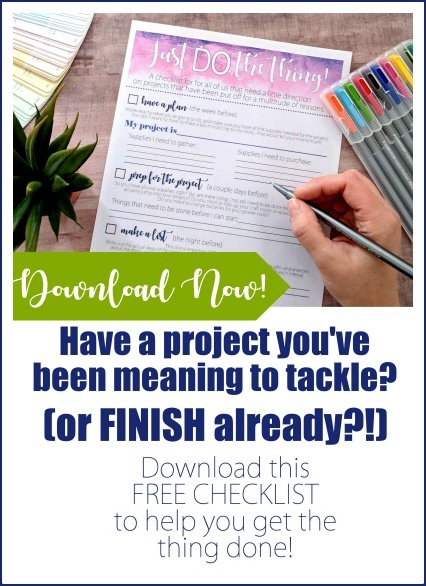 I’m a designer, and fellow crafter/diy girl, and my husband and I are also struggling with infertility….I hope our journey turns out as successful as yours! Wow, this is stunning! You are incredibly talented no matter how easy you say it was to do. I so overly inspired right now!!! I just need to find something I can do that to!! Linking from YHLa. This piece is stunning! You are very talented. Gotta run and read the rest of your blog! Amazing! You are so talented. I may give this a try. Had to stop over, saw your post on YHL… one of the best things I’ve seen in a long time. Kudos!!!!! I absolutely love this! You’ve got my wheels turning. I’m thinking I’m dining room needs an art piece like this. Thanks for sharing! WOW!! That’s AMAZING! You are truly talented and you’re work outfit was pretty cool! I saw this on YHL and I am so impressed!!! I am really really excited to try this on something!! Pretty Genius!!! You’ve done an awesome job! 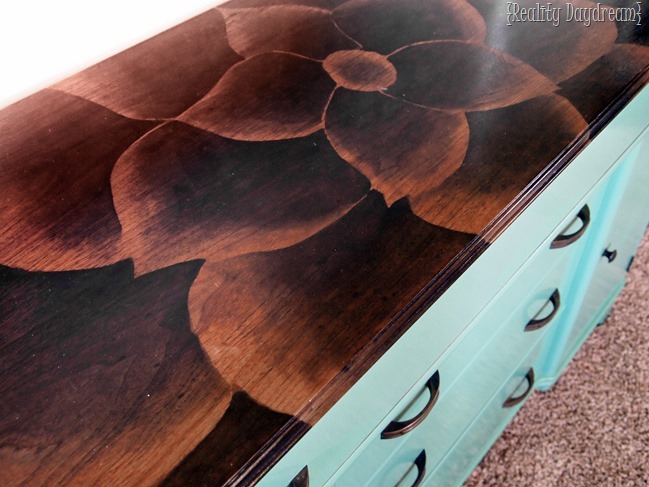 I love the stained petals and the paint job and how it all ties together! here from YHL…that is so PIMP…and I hate that word (for obvious reasons), but it came to mind when I saw this, it’s superb yo! I’m a self-proclaimed artist and I can’t wait to find something to try this on, would you say it was terribly difficult or time consuming? I, too, saw this over at YHL, and I have to say…holy hell that is a wonderful idea and perfect execution! I will definitely have to try this sometime. That is the most amazing thing I’ve seen in a while! If you don’t already have a side business selling these, you should TOTALLY start one! I just saw your feature on YHL and amazed at your artwork. This is absolutely beautiful! I know you say that it’s not that hard, but it sure does look hard. Maybe I’ll try a smaller version on end table and see how it goes? Thanks for sharing your beautiful work! This is absolutely stunning. So much home-improvement DIY stuff can be a little clunky-looking, but this is a true piece of art. Congratulations on something so gorgeous! Wow! You really are an artist. How cool to have your totally personal artwork be a functional piece of furniture. Kudos! Linked over from YHL–this is so neat! kudos! Saw this over at Young House Love! It is beautiful!! Such talent! That is beautiful…and truly unique! Can’t wait to try it next time I refinish some furniture! This looks great! I also like your painted backsplashes. I’m gonna have to remember that for ours. Stopping in from YHL, and holy cow. What a great technique! Way to be inventive! Look great! Here from YHL……that is absolutely beautiful. That buffet is lovely. I just saw it on YHL and it thrilled me when I saw it! You did a wonderful job on that flower pattern. I must say, though, you are not the first to come up with that technique. 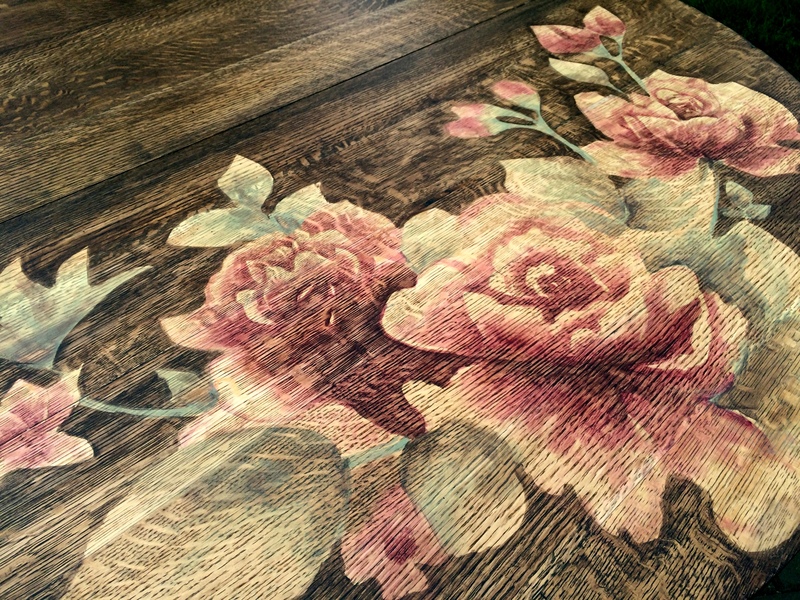 Furniture makers have been painting with stain for 100’s of years, if not more. ha! This is so amazing! Way to go! Came over from YHL. This is simply fabulous!!!! Awesome job! OMG – that is beautiful! Looks like you found something you could really make some money doing. I know I’d pay for that piece of furniture! This idea is breathtaking! I love it. I’ve been starring at a dresser I rescued, waiting to be hit with inspiration. You gave it to me! Thank you! wow this is absolutely amazing! what an inspiring job. Wow! That is some amazing work. I would never want to put anything on top of that dresser so I could show it off. On the areas that we paint, we do sand some… just to rough it up. Especially if the surface is glossy-ish. We find that it accepts the primer better and provides longer-term durability. You could also use a deglosser. How can I purchase something like that you’re willing to sell? Aside from seeing people’s blogs on pinterest when I see something I like, I am not really into the whole blog-o-sphere thing and I’ve never left a comment on someone’s either…. this buffet you created is one of the most beautiful and creative pieces of art I have ever seen and I just had to tell you. It caught my eye immediately and I just knew I had to try it…your work is beautiful and if I ever get around to finding the right piece of furniture I will show you how your art inspired me. Hi! I love this beautiful piece! you are so creative!!! so i have a couple of question to ask and im BEGGING you to answer me. please! so here is my questions 1. what kind of paint did you use to paint the green part, like is it spray paint, wall paint, etc. 2. what kind of brush did you use (if it wasn’t spray paint) like was it a normal brush or was it a sponge roll brush. please answer me, I’m begging you, ill send you the pictures when i do it. thank you. again, this is gorgeous and your super creative. email me at sydneynajarro@gmail.com please! Hi Sydney, the paint color is Sherwin Williams ‘Grandview’ Satin Oil-based interior paint. We used a paint-gun to apply it. Can’t wait to see pics of your project! Did you use the gel stain? Way cool..Love your work.. Keep up the great work!!!!! Super cool. You’ve just sparked some inspiration in me – thanks! Brilliant idea and excellent execution. You’ve changed my opinion of using stain on woodwork! That is some talented work right there!! Wow! My first time visiting your blog! I am impressed. 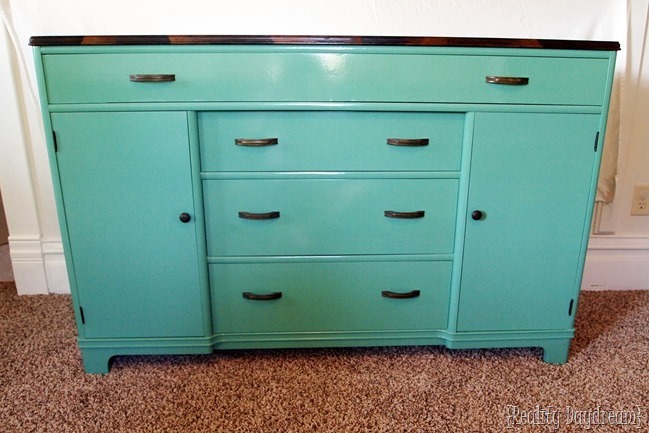 This is really beautiful and I love how you chose a vibrant turquoise to balance off the dark stains. WOW, gorgeous. Seriously speechless, you are so talented! What an amazing job you did! Really original and really well done! Love it! I saw this on Pintrest, it is absolutly STUNNING! I would buy this in a heartbeat. It’s hard to know what you did wrong… I’ve only used this technique just this once, so I’m no expert… yet! I’m not sure what you’re talking about with the ‘conditioner’. It could just be a difference in wood. Perhaps the grain was more open and soaked up the stain much faster? Being outside with a breeze can definitely make stain dry faster. I’m really sorry it didn’t work for you! Maybe practice on some scraps of wood? Absolutely incredible! I’m very inspired, and I can’t wait to find something to try this on! I’m sure since a bazillion people comment on your blog, you will probably never see this lowly comment, but if you do, I think a chevron pattern in this technique would be pretty awesome. Bethany, that is amazing! You are truly an artist. So gorgeous! Bethany, I will take a picture and send you a picture of it. I am so proud of myself and now I’m looking for the next piece to do this on. I enjoyed doing it soooo much!! Thanks for the inspiration and your AWESOME tutorial!! You are a flipping’ genious!!! Wow…love this beautiful technique! Thanks for sharing! Robin! If we live in neighboring towns, I want to SEE your creation! I just wanted to let you know that you have inspired me to try this out myself only I have done it on a much small scale and did a round side table that I bought off our local Facebook for sale site. It was a learning experience and I am definitley going to be doing this again! Your tutorial was awesome and I have to admit I am very happy with how mine turned out since the extent of my drawing capabilities are stick people! I LOVE your blog and your ideas! By the way we live in neighboring towns! This whole piece turned out to be a beautiful work of art! with a really cute story to go with it! I hope you will send a picture of this to the lady, and especially the man that thew in on the burn pile! Ha! THAT is freaking awesome. I can’t wait to try that out myself! That is ABSOLUTELY GORGEOUS!!! My husband is begging me to try something like this. Thanks for the great inspiration! We’re don’t really have any advice on how to price things. We’re pretty unsure of that ourselves. But being avid craigslisters ourselves, we kinda have an understanding of the market for furniture in our area… but I’m sure it varies all over the country. I would encourage you to start frequenting the craigslist in your area and learning how others price their items. Good luck with your bureau! Send us pics when you’re done!! This is absolutely gorgeous! I am usually a lurker and not a commenter, but time after time with your amazing artistic pieces you blow me a way. Would you consider doing a post for how you sell the pieces on craigslist? I am out in PA and am so inspired by this piece that we just picked up a free bureau off of CL…but am not at all sure how to get it sold (or price it) after we fix it up. Again, AMAZING! Thank you for being such a source of creative inspiration! Beautiful and just the inspiration I needed! I have an old oak library table in my basement. I’ve been putting off finishing it because my plans seemed too mediocre. Now I know what I’m going to do and can’t wait to get started! What a unique and beautiful piece! Your blog is officially the first blog that I have joined because I want to continue to follow you and see what your talent brings next!! Holy Cow! You did a GREAT job!. I wish I lived closer so I could buy it. Echoing everyone else, WOW! That is absolutely beautiful. What a great way to hide a flaw so you would never know it was there. WOW! Turned out amazing. 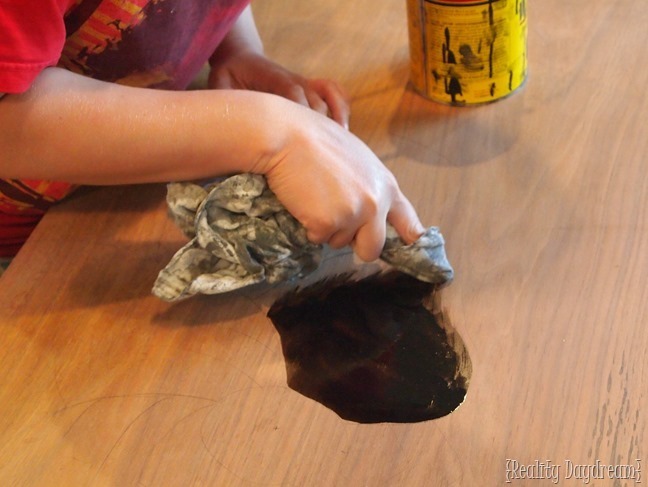 Great idea using the stain to create the artwork. I’ll have to try that on a piece one day. Just wanted to say that I am SUPER excited to see this post! 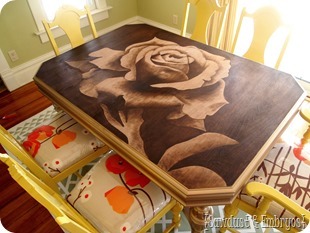 I’ve been looking for ways to extend artistic talent to furniture and this is PERFECT. I cannot wait to put this touch on a piece, I’ll be sure to post back! I have NEVER seen such a beautiful piece of furniture! 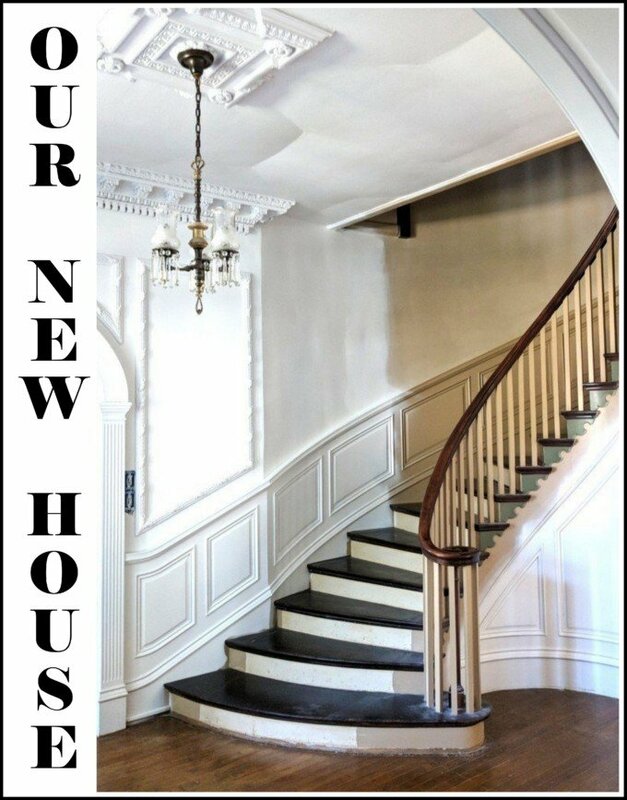 And I agree; you need to email a picture of the finished project to the seller. Wow, that looks great. Everytime I read your blog I am more and more inspired. Thank you!. This is LITERALLY amazing. You are my furniture-transforming HERO. Hats off to you! Briliant! Absolutely brilliant! I love it! I was wondering too, how much are you asking for this beautiful dresser? Looks like a piece of art, beautiful!! another genius and incredibly beautiful piece! bravo! SO awesome and I LOVE the front, the handles with the teal just perfect. This is truly fantastic. And I am SO inspired. I’m definitely going to try it, maybe even this week! Coolest piece of furniture ever. OH MY GOODNESS! That is beautiful!!! You did such an amazing job! It came out absolutely GORGEOUS!! Not to be too nosy…but how much are you asking for it? best i’ve seen yet! well done! OH. WOWZA. That is beeee-uuutiful. I know thogh I would never have the patience to do that. You are so awesome! I love this! Please tell me you are going to send the after pics to the original owner. She may want it back! Oh my gosh – that was soooo worth the wait! It is beautiful! 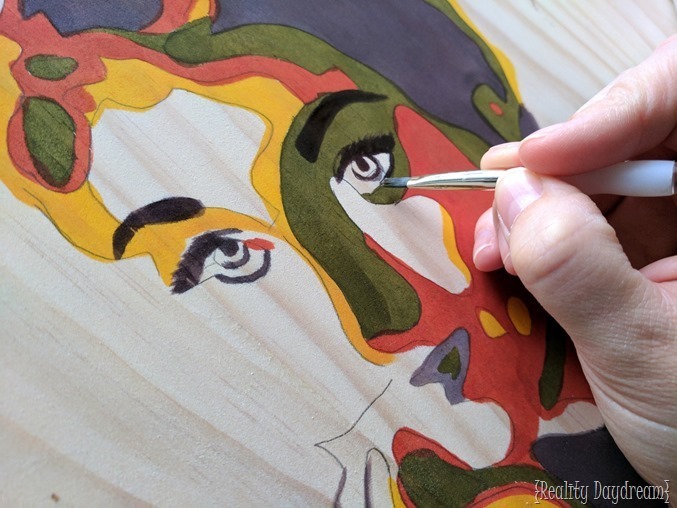 I love the idea of using the wood itself for the art! You make it sound so easy but I know better than that! An absolutely gorgeous piece. You should be very, very proud of yourself! Absolutely gorgeous! What a cool idea! AWESOME…this is so neat. I’m in love with the green too. Great idea. It looks lovely. This buffet is gorgeous! If I had room for it and it matched the colors in my house I would buy it. I’m pinning it. That is so gorgeous!! Think you could do a piece with that on the front a la the girls’ changing table? That would be so cool! Because my only qualm would be that “stuff” would go on top and the best part of the buffet would be hidden! wow, that is awesome!! If i needed that peice I would be all over it! !